Gaspar’s……"The Portuguese Sausage that the whole world can enjoy!" 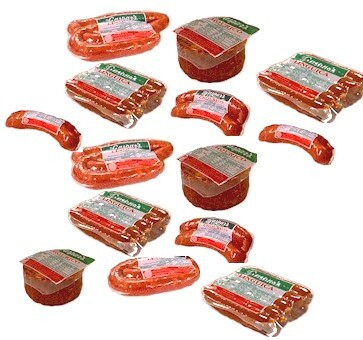 Now is the perfect time to order Gaspar's linguica and chourico for the cookout, party, or any occasion. We have put together an INTERNET ONLY special to make ordering easy and take the guesswork out of ordering if you're trying our products for the first time. GASPAR'S FAMILY FEAST includes a combination of 18 pounds (approximate weight) of mouthwatering Gaspar's linguica and Chourico. You will receive 5-lbs of Linguica, 3-lbs of Chourico, 1-lb of Extra Hot Chourico, 2-lbs Bite-Size Linguica, 2-lbs Chourico Patties, 2-lbs of Linguica Patties, 2-lbs of Linguica Franks, and 1-lb of Mild Chourico. Gaspar's Linguica - A Portuguese sausage that is mild, lean, and full of spices. These spices are a secret blend (over 100 years old) and when the meat is slowly smoked and cooked in a smoke house... you can imagine the delicious taste of the final product!!! These sausages are great for sandwiches, chili, stuffing, pizza toppings, or on the grill. Linguica is approximately one pound. Gaspar's Chourico - It is the made with the same recipe as linguica but has more of a "kick" to it. Chourico is a spicy sausage with a heartier spiced flavor and with different spices that are known to "Kick it up a Notch." Copyright 2012 Gaspar's Sausage Co. Inc. All Rights Reserved.